Acai bowls are a super yummy indulgence fitness trend right now. The bowl is made from the acai berry, a super fruit originally hailing from Brazil. The berry gets pureed and takes on a sorbet-like texture as the base of the bowl. The puree can then be blended with other fruits, or left as is. 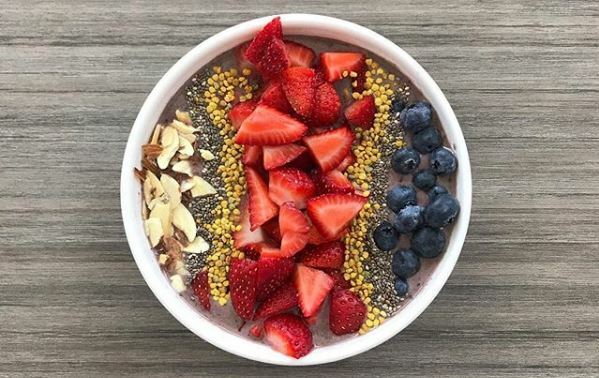 As a finishing touch, it then gets topped with anything ranging from oatmeal to fresh fruit, or different types of obscure food items including chia seeds or bee pollen. The combinations are endless, but the health benefits from eating these are also worth checking out. Check out why Acai Bowls are beneficial for your health and are the latest fitness trend. 1. Full of nutrients: Acai berries are pretty unique because they have a high fat content, but are super low in sugar. They also have vitamin A, calcium and a bunch of important minerals. 2. Loaded with antioxidants: Without antioxidants, free radicals in our body can damage cells as well as lead to further diseases such as diabetes or heart disease. The acai berries have three times the antioxidants as blueberries, and are definitely good for you. 3. Good for the skin: The oils in the acai berry have been used by the Brazilians for years to achieve younger and healthier looking skin. By eating the berries, your body is able to get rid of old or unwanted skin cells faster. 4.Improved digestion:These berries can help you clear out unwanted toxins, and are also a great source of fiber. They can help keep your digestion regular and will improve your morning energy as well. 5. Brain function is boosted: Acai berries are full of various plant compounds that can prevent brain damage as you grow older. This super food can also improve memory and learning. What is your favorite way to eat an acai bowl? Let us know below!